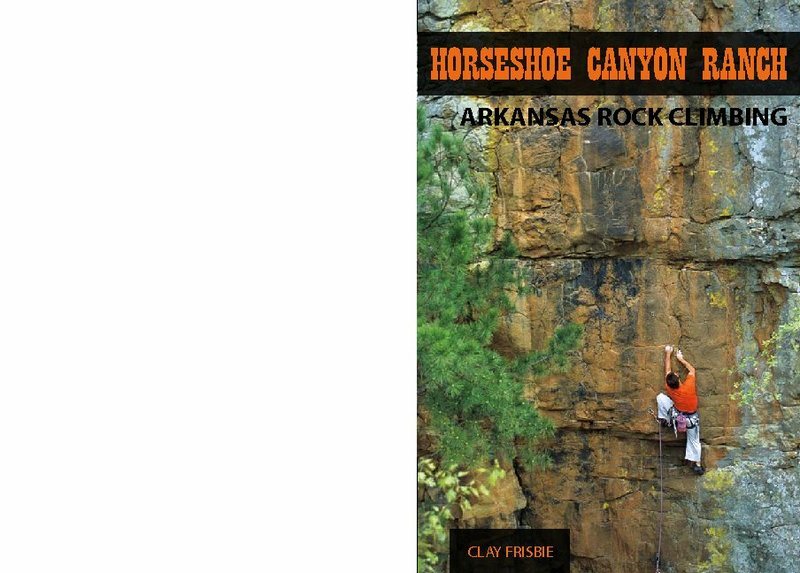 Horseshoe Canyon Ranch (HCR) offers some of the finest sandstone in Arkansas with nearly 420 routes ranging from 5.5 to 5.14. The majority of the routes are fully bolted sport climbs, but there are also many fine trad routes and a plethora of good boulder problems. The cracks at the Ranch are some of the best in Arkansas and will challenge even the saltiest of crack masters. Surreal sandstone climbing in a spectacular setting with all the amenities of a four-star dude ranch make this one of the most unique and enjoyable crags you will ever visit. The Buffalo River is on the other side of 74 hwy. Hit the BRT, a 40 mile hiking trail. Ponca offers rentals of kayak, canoe, and rafts, or bring your own and float the Buffalo - one of the only pristine rivers in a national park not crowded with houses and other nonsense. There are cliffs along the Buffalo that beg to be climbed, so bring your synthetic shoes. Camping is $5 per night, climbing is $10 per day. Restrooms, sinks, and token showers were added in 2012, making this a great base for multi-day excursions. Sign in at the Trading Post and check out the gear. HCR is located approximately 7.0 miles west of Jasper and 6.5 miles east of Ponca on the south side of State Highway 74. Jasper is approximately 25 miles south of Harrison and 65 miles north of Russellville on Scenic State Highway 7. A NEW (2013) full color guidebook for the area is available for mail order and immediate eBook download at www.bostonmountainpress.com. The 200 page guidebook is full color throughout and provides complete information on all of the over 420 sport and crack climbs. Also featured is a comprehensive and updated look at nearly 250 boulder problems on the ranch. All route and problem information is color coded by rating. Another one of Chili, well, chillin on the porch. Really trying to "warm up." On the Titanic Boulder. Classic 5.8 Arete. Panoramic from the store porch. View towards the Goat cave, from the campground. The idyllic Horseshoe Canyon Ranch. Sunrise over the east side. Watching the sun come down at the Ranch. Entrance sign to some fun climbing. This is one of the best places I have ever been to, to bring new climbers. TONS of easy and moderate climbs with forgiving rests and holds. Not too tall either. In addition there are classic 5.8's next to classic 5.12's so the experienced climber can belay the newbie, take a few steps and work a project. February Temps can be decent depending on how things shake out and how late in February you go. It'll probably be getting up to the mid to upper 40's maybe almost the 50's in the day and at night it'll drop down to below freezing. Again, this really depends on the year though, I think the ice storm that ripped through there a few years ago was in late January early February, so it really just depends. This area is well worth the $5 fee. There are hundreds of routes on superb stone. The bolt jobs are excellent with bomber hardware. It looks like glue-ins might be the new standard for the area. The bouldering looks amazing, and there's tons of it too. The setting is pretty amazing too. It is a true ranch with horses, cattle, goats, pigs, dogs, and cowboys. I was just there last week. The weather was unseasonably warm, but quite nice. We did see about a dozen ticks during the two days we climbed there though. P.S. Chili is a sweet dog, and the people who run the place were very friendly! We were there a few weeks ago. You can camp at HCR for $5 a night (I think) and I believe they now have showers/toilets. There is another new guidebook (2013) that is the official guidebook for 24 hours of horseshoe hell. It breaks up the guidebook with the roped climbing in the first half and the bouldering in the second half. DOES ANYONE KNOW IF DOGS ARE NOW ALLOWED OR NOT?? @Siberia, you can occasionally find people in the middle of the week, but HCR's busy days are usually just the weekend, with some people climbing on Friday or Monday as well. I wouldn't count on it being too populated during the week. If you plan on camping and climbing here expect to pay $15 a day for one person. Not what the books says. It's $5 for camping and $10 for a day pass of climbing. Also if you're climbing on the DMM permadraws from the 24HHH be careful. They are aluminum draws that got a lot of use from the comp and general climbing season. Was there this past weekend and found some scary sharp draws on well traveled routes. I highly recommend inspecting any DMM permadraws you clip into. Told the staff there and hopefully they replace them/keep an eye on them. Second what Chase said. HCR is an awesome place to climb, but July and August would be a perfectly miserable time to climb there. Try something up north like the Mt. Rushmore/Custer State Park combo in South Dakota instead at that time of year. Interesting - I was vaguely aware that Arkansas existed and now it seems it has good climbing! Question to locals: would you drive 30 hours to get to that crag for about 7-10 days, if it wasn't that close to home? I'm from the eastern Canada. Usually go to Red River & the likes up east that are closer, but then it's always fun to discover new areas... Follow-up question: would you drive 30 hrs to go to Red River for that amount of time (or alternatively, what location would be awesome enough you drive 30 hrs to for 7-10 days of climbing)? Can someone clear me up, please. Based on my review, MP is missing 80+ HCR sport and trad routes. Of course, 80 out of 500 is not so bad. But, if you know them, please add missing routes.